Nepal is river runner's paradise. The fact that you want to raft down Nepal's challenging rivers means that you have long ago graduated from the nursery school or " row row row your boat. " The many 'raft-able"rivers in Nepal meander between canyons,villages,and virgin forests,wildlife, like needle through thread, weaving the country's rich tapestry of ethno-culture cultural and bio-diversity. Originating in the bowels of the Himalayas, these rivers flow across the length and breadth of Nepal and neighboring India , before emptying mostly into the Bay of Bengal. Rafting in Nepal is usually a 'wilderness' experience in that most rivers don't have highways alongside them - but it's a soft, tamed,wilderness with white beaches for camping clear blue rivers, friendly locals and few "nastiest someone described it's " blissful escapism." Now a days Nepal is a peaceful democratic country where rafters and kayakers get a warm welcome. Upper seti is one of the thriller short white water rafting trip among Himalayan Rivers, it's located just outside of beautiful city Pokhara. It's take 30 min up to there,this rivers offers non stop world class 4-/4+ rapids with amazing mountain views and small gorges which provide adventure of lifetime . 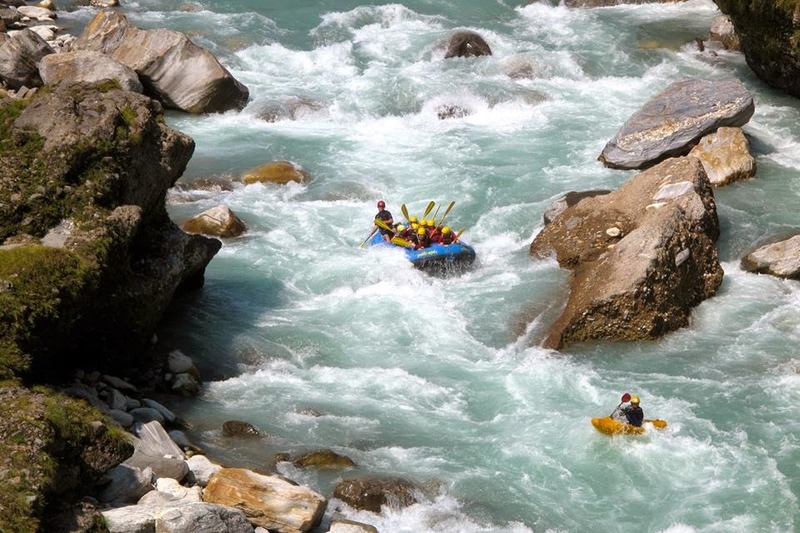 It's called Nepal's most popular rafting river with 3+ rapids , rises high in the Himalaya at Gosainkunda the God Shiva drone his trident in the ground to create thee spring the source of the river and hence its name Trisuli. It has impressive gorges and some moderate white water, few exiting rapids are balance by another easier section . Easily accessible for anyone who have short on time and fits perfectly in to other travel plans. The Seti rivers rises on the south east slops of Machhapuchhre and passing through the two beautiful and contrasting areas with 4+ 5- rapids . Relatively small volume with straightforward gentle rapids it is truly a great fun trip perfectly designed for you to take your nearest and dearest ones on the raft. Plenty of chanes to swim in the crystal blue warm water. Marshyangdi rises on the northern slops of the Annapurna Mountains flows east through an arid valley around Manang an than swing south to join the Trisuli river at Mugling this raging river used to be one of the finest world class white water with massive volume water, technical and continue 4+/5 class rapids.it demands your total dedications. One of the famous names around Himalayan rivers, named after the goddess Kali, raises high on the Tibetan Plateau in Mustang and cut of the world's deepest gorges between Dhaulagiri and Annapurna Mountains. This largely un spoiled 'Holy' river provides lots of bumpy and exiting 60 set of fast and medium length white water rapids around 62 km. including spectacular views of Mountain Backdrops,green lush waterfalls,typical villages, Temples ,gorgeous sandy beach campsites. Sunkoshi means river of gold name of the gold that sometime panned from the river gravels. This is one of the top ten best white water rafting river of the world. Big rapids warm water , beautiful scenery and great camping sites make this a classic multi-day's river trip, the river rises near Tibet and flows eastward Nepal through the great valley between the Mahabharata Mountain and the Himalaya. The Nepal's longest and largest karnali river with tributaries feeding than any other river of Nepal. Its makes the largest river for commercial rafting trip. It is situated in the most remote western region in Nepal. So it becomes more than just a rafting trip. It is an expedition. This river rated grade 4+ to 5+ huge series of continuous wild rapids. The bank of rivers are lined with coniferous forest and along the low reaches pristine Rudyard Kipling style forest that has all but disappeatria from reason of the Himalayas. The river runner has reported sight seeing of much wildlife including the exclusive and mysterious 'Route' People. also any bond can enjoy the fishing of great Catfish and Golden Mahashahar. 1. Extreme River Rafting Pvt Ltd.
2. Paddle Nepal Pvt Ltd.